There is no formal teaching of pinyin or characters in Pre-K 3s. 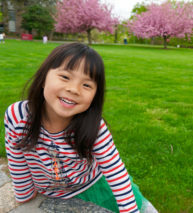 Children are taught to express themselves in Chinese through nursery rhymes and pictures. 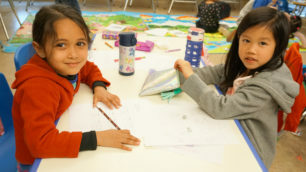 During the 2 ½ hours of class time, children are engaged through crafts, drawing, story time and outdoor time. The goal is to give the students a basic understanding and appreciation of the Chinese culture and language through a variety of classroom activities which, in turn, help student to improve their language skills. Through nursery rhymes, stories and classical poems, students are taught basic Chinese consonant/vowel combination in preparation for pinyin learning in Kindergarten. Students are encouraged to take the lead in learning through games, sound mimicking and story-telling. Both pinyin and Chinese characters will be taught in Kindergarten class. 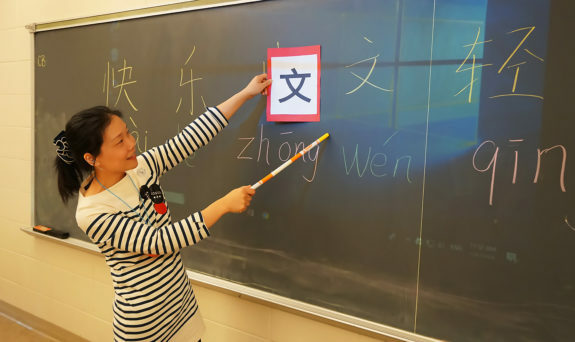 By the end of the school year, students are expected to be comfortable with the pinyin system, be able to recognize up to 100-120 characters; be able to read short passages; be able to recite short poems and write characters with correct sequence of strokes. During the 3 hours of class time, students are engaged by show and tell, word recognition, reading, crafts, games and outside time. 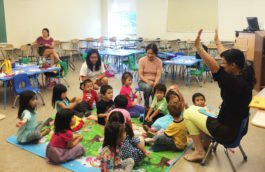 Pre-K and Kindergarten classrooms are furnished with child-size furniture and floor mats. Students stay with one teacher and remain in the same classroom for the entire school day.